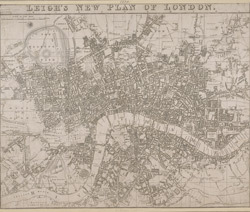 This is the second edition of a map of London first published in 'Leigh's New Picture of London'. The title appears along the top with a scale bar at the top right. The map is divided into half-mile squares with letters along the top borders for reference. It also shows Southwark Bridge and the proposed New North Road across Finsbury Fields.